The active loudspeakers LDPLAY12A and LDPLAY15A with integrated USB/SD-Card-Player and illuminated display offer comprehensive connectivity and setting possibilities for many types of applications like school, kindergarten, church, sports field, multimedia presentation, party room and so on. It is a very versatile and affordable sound system. The USB/SD-Card-Player can be operated directly or by using the supplied infrared remote control from the front or from the rear side of the speaker. Simply plug in your USB-stick or SD-card and let the music play! Connectivity for external sound sources like microphone, CD-player, mixing board is also integrated as well as a 5-band equalizer that allows various sound settings. Ergonomic handles and a 35 mm standard stand support complete these great features. top vocal microphone. 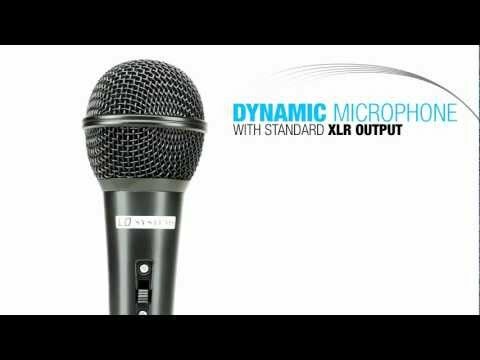 The D 1001 mic features a low-feedback dynamic supercardioid and condenser vocal microphones with a broad frequency spectrum, low distortion at high sound pressure levels, and “shockproof” capsule mounting for minimalhandling noise. Suitable for all demanding stage applications. Low/mid driver voice coil 119 "